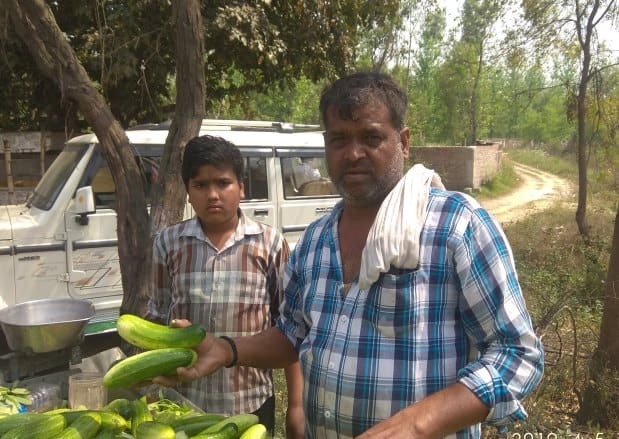 Chandrapal, 54, from Khatauli in Uttar Pradesh, set up a pushcart full of cucumbers at the venue of Narendra Modi’s rally in Amroha on April 5. He favours neither the Congress nor the BJP. “My family is my first concern and such rallies help me make an extra buck for them,” he tells LokMarg. I have a family of six to take care of. Two of my children go to school too; their fees and uniforms are a major setback. I sell vegetables and fruits at Khatauli (in western Uttar Pradesh) market every day for a living. My first and foremost concern is how to increase my income. And I have little faith in political parties or their leaders to be take care of my interests. I will have to deal with them myself. We lead a tough life, with little time for entertainment like these (pointing out to the mad rush at the BJP rally in Amroha). For us, such large gatherings are an opportunity to eke out some extra income. Whenever I come to know about a political rally in the vicinity close to my work place, I grab the opportunity. And I am not alone in this. Take a look at the sugarcane juice sellers or other refreshments. Your judgment about what you are going to sell works a lot. Since it is getting hot in the day, I chose cucumbers. They are cheap, within the budget of a villager and cools down the parched men. Of course there are several options; one has to choose that one can handle. If I end up with some surplus, I can use it on my vegetable stall for the next few days. I am teaching these tricks of the trade to my son, Sooraj, who is here with me. He is studying in Class XI. I do not want him to become a vegetable vendor but he is a good helping hand, and it is never too early to learn the ways of the world. The business a bit slow right now. But I am sure, when the rally ends, there will be a rush of thirsty men towards the main road. I hope I am able to return with an empty cart. This is the dream of every vendor that he does not have to carry any of wares back home. I too hope I made the right decision by betting on the cucumber.